Cooking Joy is a cooking time management where the cook fulfills the order of the customer. Cooking, assembly and delivery is the key points in winning this game. The setting is in an island with different types of restaurants. Each restaurant has it’s own menu and it takes a lot of finger skills and attention to get 3 stars. Just like any other time management game, there is a time limit and a goal as to how much it is needed to earn. The game started off with a tutorial on how to play the game. With each new ingredients introduced, the game will start getting a bit harder. But the good thing about this game, it really isn’t that hard if you just have the fast hands. Each level has 3 stars to achieve. 3 stars means that you have achieve OVER the recommended coins to earn in each level. If not, then you get either 1 or 2. You can restart the level if you are 3-star obsessed (just like us) however, you need to take a look at your “energy” at the upper left. The energy is the number of tries you can try again on a certain level. Each level completed earns you one energy. So you don’t have to worry if you lose all that energy unless you restart the level over and over again. At the start of the game, you are given a free unlimited energy for 60 minutes. If you somehow used all your energy, you have to wait 30 minutes to get a new one. Cook ahead. If you know that the ingredients takes a lot of time to prepare, cook and prepare it before any customers come. When there are a lot of customers coming, multi task – this is the key. Cook, Assemble, Cook, Serve. Use both hands in playing. This way you can give the best “service” to your customers. Each restart of the game, the menu is always the same. So if you have a good memory, you can prepare ahead. Sometimes the levels are a bit hard to achieve the 3 star rating. Take a look at your upgrades. Perhaps there is an equipment or ingredient that can earn you more coins or gems. Earning 3 stars earns you gems and coins and of course, energy. So aim to get 3 stars in each level. The good thing about this game is that it gives the user some recommendation on which equipment or ingredients needs to be upgraded. Just follow the recommended guide in the game unless there is something you really need to buy in order to get 3 stars. You can also upgrade your chef’s speed or customers patience. It needs gems to upgrade it. 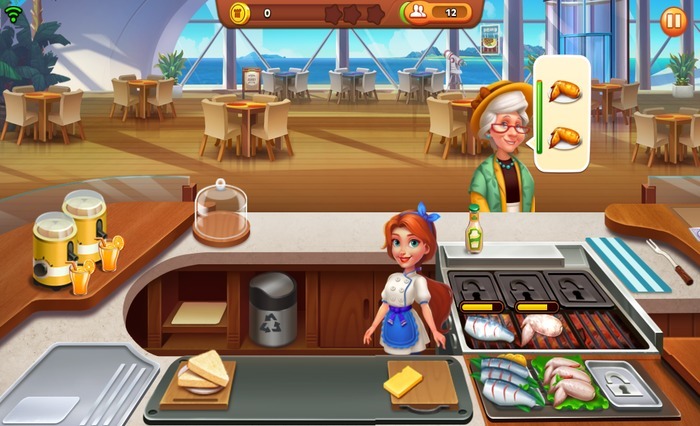 Earn as much coins and gems since this will be used in moving to the next restaurant and upgrading equipment’s or ingredients. Go to the Fortune Teller to get free coins or gems or watch videos to earn coins. This is one way to fast track on getting that upgrade that you always wanted. There is also a daily coin and gem to earn. Addictive and just can’t put the phone down. This type of games has been done over and over again but what’s so great about it is that it’s not that hard. It has the right amount of “challenge” that you can overcome. Although we just recently started but we are eager to finish all restaurants and see how it ends. Love keeping your hands busy? Cook and Earn money in Cooking Joy!